Model No. A-2. Fully Automatic Die Casting Mortice Handle. 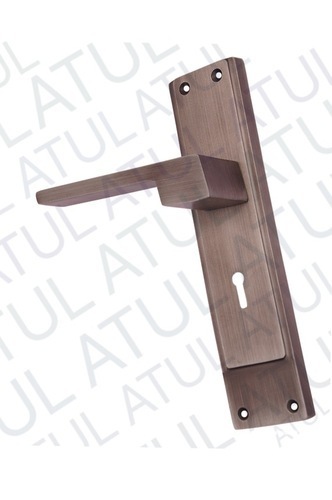 Aluminium Handle Plus Aluminium Plate. Already supplying to many big companies and wholesalers. Very good quality mortise pair. Available in many finishes. Size:- 200 MM. Prices may vary according to finishes. We are working in this field from past 30 years to provide high quality technical and luxurious hardware products to our clients. Atul India is a proprietership firm owned by Atul Kumar Agarwal and being operated successfully under the management of Dhruv Agarwal. We have our three units in all. All the units are situated at Aligarh in the radius of 5kms. First unit handles the manufacturing of all the hardware products from the raw materials. Then all the manufactured product are then sent to the second unit for polishing and finishing of the Product. Then at last all the finished products are sent to our third and last unit for the checking,packing and dispatching of the products. In this way the product is manufactured in our company. When we started our company in 1989 we do not have much resources and facilities to enrich and upgrade our industry. But now at present we are eligible to fullfill any requirement of any client worldwide at extent level, this is possible only due to the hardwork of our proprieter Mr. Atul Kumar Agarwal. He is a man with faith, success and excellence. Our mission is to serve all customers a better home decor products than anybody else in the queue. Our vision is to manufacture only quality and superior products.